This “thought experiment” asks players to determine what can and cannot be defined as soup—and it’s trickier than it sounds. What is soup? The question seems painfully simple on its surface but becomes more perplexing the deeper you think about it. Does it have to be a liquid? Must it come in a bowl? Do you have to eat it with a spoon? Does it have to be edible at all? As you ponder these questions, a sort of existential fear begins to sweep over you: Turns out understanding the nature of soup might actually be more painful than simple. And guess what… Now this bizarre thought experiment is available online in the form of a flash video game! Something Something Soup Something is a short, free browser game created by Italian philosopher and designer Stefano Gualeni and his team at the Institute of Digital Games. The backstory and introduction are a bit bizarre but it leads to a surprisingly satisfying conclusion. In the year 2078, humans have teleporters and, obviously, use them for cheap labor, including getting aliens to make soup. “Due to categorical differences in language and cognition, however, the aliens often misunderstand what humans ask them to produce,” the game states, and so it’s your job as the player to look at a bunch of bizarre alien soups and decide which are worthy of being served and which are not soup. Warning for first time players: You have to go through an annoying and seemingly unnecessary step to “activate the teleportation device” before you get to the actual soup part. However, according to the designers, this section “quantifies the performance of the ‘players’ in relation to a pre-established goal...” And that’s actually one of the most interesting parts of the game: When you finish, the game provides you with a breakdown of what you consider soup. 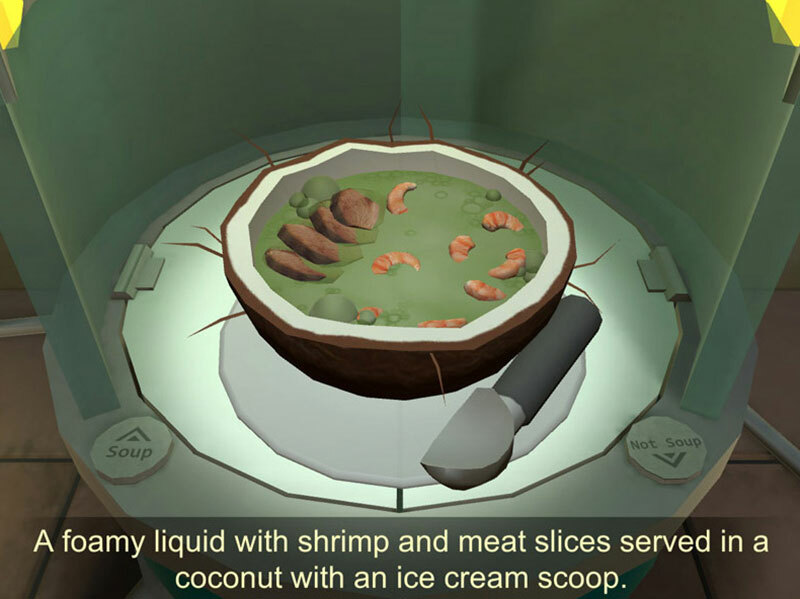 Over time, the game will be able to compile information from all of its players to create a “comprehensive theory of soup.” As the game says on its website, “Something Something Soup Something could be defined as a video game. We prefer to think of it as an interactive thought experiment.” Along those lines, activating the teleportation device can be seen as its scientific control. And to be fair, the game isn’t even necessarily designed to be “fun.” Instead, the team behind it explains, “it is designed to reveal, through its gameplay, that even a familiar, ordinary concept like ‘soup’ is vague, shifting, and impossible to define exhaustively.” Yes, if you’re more into entering dissociative states than shooting bad guys, Something Something Soup Something is your Super Mario Bros.